Summary – The most flexible and valuable feature in a contest is the “Custom Entries”. This is a feature that can make or break the success of a campaign. Essentially this feature gives you the opportunity to reward your contest entrants for doing ANYTHING! Below is a list of the best custom entries to use in your contest! We have examples from some huge brands that used this feature to get some huge results that outperformed any campaign they had done before! So we know that custom entries are important. They allow you to set a question/task for your entrants. This is super handy as you can use this system to game “organic” actions. A few of our favorite custom entries are below and will help you grow your business in all areas, not just your email list! This is a fantastic way to increase the validation of your social posts. All you are doing is rewarding a few entries into your contest for doing so instead of having to pay Facebook for an engagement campaign. PRO TIP – chose a post that you are running ads to. This will increase the engagement on your paid post and get you a better relevancy score as well as improve your CPM which should lead to lower conversion rates and higher click-through rates. Here are some Facebook ad results from a recent client that used this technique. This is prospecting traffic as well (does not include remarketing, past purchase or any of that other stuff that the Guru’s try and trick you with)! This was used by Foundr Magazine to drive engagement and readers to their blog. They chose a popular post and got people to read the post, comment and share it. It is now the most commented on a blog post with some of the highest shares and traffic numbers. For the question, ask them what their main takeaway was from the blog post. Or you can ask them, “what was the blog post about”. PRO TIP – By asking for feedback on the post you can also relay this to the content team to see what people thought about the post. Incorporate that feedback into your next blog post. Read bout Foundr’s contest with VYPER here. This was used by Scotts Cheap Flights to grow his Facebook group to huge numbers. All you are doing is sending people to your Facebook group to join then asking them a question such as, what is your Facebook username? This is great because a group has a much better reach than a Facebook page. So any future posts in your group will reach more people. PRO TIP – this can be used to grow any community, a slack channel, subreddit etc. How do you get your customers to notice you and listen to what you have to say? Connect with them on multiple channels and make sure your message gets through. This custom entry is perfect for building a second “email” alternative. The open rates are over 80% and CTR’s can be above $20-30%, when was the last time you saw that in an email? So the idea here is to use a service such as ManyChat or ChatFuel to manager the messages etc. You will want to create a signup page with the service (takes 15seconds) then take that link and use it in the customs entry of your contest! PRO TIP – have an automated messenger sequence setup so that when someone signs up they receive Facebook messages about your brand’s offers, products, promotions, news, interest facts, industry secrets, niche benchmarks. Always remember to add value, the world is not about you, it is about the customer so make them feel like it! If you can’t prove value, at least entertain them with funny gifs and cute dog photos! This contest custom entry can be used for any platform where you are submitting your product or service. A few of the big ones are Product Hunt, BetaList, The Awesomer, Cool Material, Incredible Things and good old Reddit. Ideally, this custom entry allows you to incentivize people to upvote or like your listing which increases your ranking in these communities. 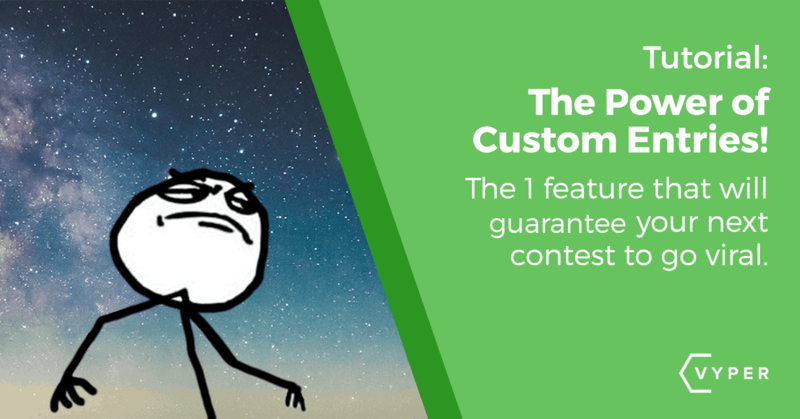 PRO TIP – use a contest in conjunction with the new launch of your product or service. It is a great way to build traffic, awareness as well as grow your email list and social accounts. We have also had a few customers using this method to build exposure and market their initial coin offering (ICO) which has been interesting and one of the top ones resulting in over 85k entrants. One thing that companies do not do enough is listen or even ask customers what they want. Peoples time is valuable so in a lot of cases, you need to incentivize them to share their opinion a contest custom entry is perfect for this (you do not have to give discounts or cash to get feedback). This one is a little more specific for local business so the contest promotion channels need to be relevant. Essentially this custom entry will incentivize people to at least look at your event and consider it. Just create the question and drop the link to your Eventbrite or Facebook event and get people to register. PRO TIP – offer some sort of bonuses if they actually attend, this will make sure that people do not just signup and not attend. A few users of VYPER have run a contest and then said they will announce the winner at the event. This one is a little more scalable than a physical event and we had the company “Launch Summit” execute on this custom entry perfectly. They created a contest and had the custom entry to signup to their Launch Web Summit. Signing up was free and they made money on upselling VIP tickets (getting access to speakers and replays). This was the event they were promoting – take a look at the Eventbrite listing. 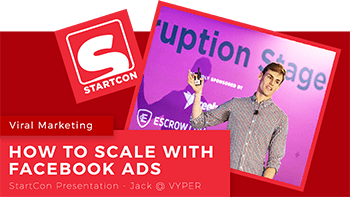 Here is another article how this company also used VYPER to generate $55k to fund their web summit. PRO TIP – make sure you mention the speakers, value of the summit and more in the contest description to build the desire for somone to attend. By using a Leaderboard contest, this user was also giving away VIP tickets to whoever collected the most entries from sharing the summit! 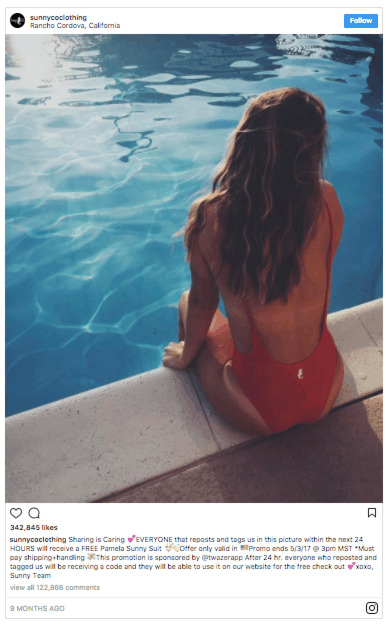 This works well for ecom physical products, the most famous example is the “red bathing suit” company. They get a huge amount of people to re-gram an image of the product they were giving away. The question you would want to ask is. What is your Instagram handle or what is the URL to your re-gram? If you’re looking to improve your SEO this custom entry can help build some some serious links. Shopify is a classic example of how to use a contests to build backlinks. They used this strategy to spread the word about their “build a bigger business” program. What they would do is create a contest and require that entrants write a blog post and send in the link to that post. The best written blog post would win the a prize. This has worked extremely well for them, so why not try it for your business. So if you’re looking to really make your next contest go viral. The number 1 piece of advice we could give you, is to leverage the custom entries feature. Share your own custom entries in the comments. If you are interested in running a viral contest, checkout VYPER here. If you need help promoting your contest, download the guide below. CMO at VYPER. Paid acquisition specialist.